On our most recent trip at Goodwater Loop, be ready for the upcoming trip report on Monday, BeeGee had a little bit of a scare. For a few minutes, I thought her stomach had flipped. A flipped stomach is also known as bloat or Gastric Dilatation Volvus (GDV). Thankfully, this wasn’t the case, but I thought I would post about it to raise awareness for dog owners. GDV is two conditions happening at the same time. The first being that the stomach distends or fills up with gas and fluids. The second is that the stomach rotates and pinches off the passage to the esophagus and the intestines. This prevents the dog from moving gas and fluid from its stomach to its intestines. Also, the dog can no longer burp or vomit. The enlarged stomach can result in multiple problems, but one of the biggest is the reduced circulation of blood. While GDV can occur in any dog, it appears more frequently in middle aged to older dogs. In addition, large dogs with barrel chest are more likely to suffer from GDV, like Great Danes and Irish Wolfhounds. Furthermore, medium sized dogs occasionally get GDV. While GDV is very rare in small dogs, one exception is the Dachshund who are at higher risk because of their chest. Besides size and breed, eating after vigorous exercise can result in GDV. Eating a large meal before or after exercise can lead to GDV. This can include drinking a large amount of water before or after exercise. Finally, a dog that has had its stomach flip once, is more likely to have a recurrence of GDV in the future. Emergency treatment by a veterinarian will be required to remedy the situation. 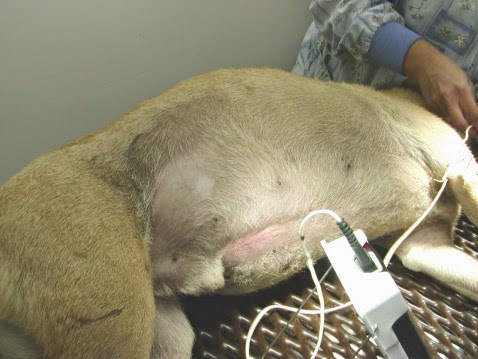 First, the vet will use a gastric tube to remove the gas and fluid from the stomach. Next, the vet will perform a surgery to return the stomach to its original position. Finally, the vet will check for any dead tissue and remove it as necessary. Another GDV preventative treatment is a gastropexy. This is when the dog’s stomach is attached the dog’s body wall to reduce the chance it will flip again in the future. This method of prevention can significantly reduce the chance of GDV in at risk breeds. However, it cannot reduce the likelihood to 0%. So if you think there is any chance your pup has GDV make sure to get them to a vet quickly because interventions are most likely required. Plus, untreated dogs have a pretty high mortality rate; it approaches 60% in untreated dogs. If you have any wisdom concerning flipped stomachs in dogs, please share it with us. Also, if you like the blog, please follow us on Facebook. Fantastic post! Thanks for the information. Thank you for your concern, BeeGee and I appreciate it. When we were at Goodwater Loop, she got hot and drank a lot of water. Her stomach got huge like a balloon, she was walking weird, and rolling around making little whimpers. She ended up burping and going to the bathroom and shrank back to normal size.